Welcome to Holly Presbyterian Church! within our church, our community, and around the world through peaceful and loving relationships. Whether you're a visitor or member, this Website is dedicated to serving as a source of congregational information and, maybe, even inspiration. Start your visit by reading the news below, or by clicking the links on the left. You will find a virtual sketch of the people and life of Holly Presbyterian Church, which will give you a sense of who we are and the journey of faith we are now on. If you have feed-back for us, please do not hesitate to get in touch with our Outreach Team chairperson Donna DeNise, our pastor, Rev. Dr. Sharlyn DeHaven Gates, or our Website manager, Walter Brown. Children's Sunday School -- 11:00 a.m.
Worship -- Easter Sunday & Confirmation Day (Child care provided) -- 11:00 a.m.
AA meeting (Community Room) -- 3:00 p.m.
AA & Al Anon meetings -- 7:30 p.m.
Office is open 9:00 a.m. - 12:00 p.m. and 1:00 p.m. - 3:00 p.m.
Friends with Needs Outreach (Fellowship Hall) -- 12:00 p.m. - 3:00 p.m.
Friends with Needs Outreach -- 12:00 p.m. - 3:00 p.m.
Presbyterian Women's and Presbyterian Men's Wednesday Evening Bible Studies (Simon Peter study concludes) -- 7:00 p.m.
"In The Beginning" Baby Pantry -- 10:00 a.m. - 12:00 p.m. Adult Sunday School -- 9:30 a.m. - 10:30 a.m.
Worship (Child care provided) -- 11:00 a.m.
A nursery is provided downstairs for children ages 5 and under. All children are always welcome in worship. Ask our ushers about age appropriate worship bags for kids! We believe it is important for children to begin experiencing worship at a young age and while they may not be able to give their attention to the entire service, they will enjoy participating as they begin to learn the parts of worship we do on a regular basis. We will be having a retirement party for Rev. Sharlyn on Sunday, April 28, after worship. Please plan to attend this joyous occasion. Ready to plant some annual flowers? Or hang some flower baskets? We are excited to announce you can get your flowers here at a good price. Tell all your friends to order from us as well. Order slips are available in the bulletin or see Bob Killewald. Monies earned will go towards payment of the snow plowing. Deadline to order is April 28th. Flowers come in Sunday, May 12th (Mother’s Day). "New Generation Seniors of Holly"
There is a copy of the special activities for the "New Generation Seniors of Holly" for April through August available on the table in the narthex. For more information call 248.634.1758. In support of the important work done by our brothers and sisters in Christ at First Baptist Church of Holly, please remember those less fortunate this Christmas Season and bring in can goods and non perishables. Items can be placed in the collection tote in the Narthex. 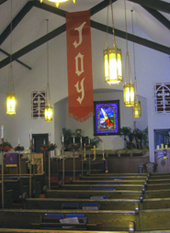 If you are interested in joining The Holly Presbyterian Church, please talk to Rev. Sharlyn Gates, or contact the church office by calling 248-634-9494 or sending an email to office@hollypc.org. An Archive of "Pictures of Events" can be found by clicking on this link. Presbyterian Disaster Assistance: "Out of Chaos, Hope"
by crises and catastrophic events. We need your help. Please give generously. 100% OF YOUR GIFT WILL GO TO THE VICTIMS. THERE ARE NO ADMINISTRATIVE COSTS. 1-800-872-3283 and donate by phone. For updates, please go to pda.pcusa.org. And for our church, our pastor, our interim pastor, and the pastor coming to lead us into the future. Prayers for Elder Linda Living-Hawley, Commissioned Ruling Elder of Tyrone Community Church. Prayers for the Rev. Desiree Lawson and husband Anthoy, who are moving to Boston. Michael and Rachel Ludwig, our Mission Co-Workers who are serving in Niger. Over 1,700 people have joined our church over the years, including 38 pastors. We remember those who have gone on before us with a link on the “Our Church History” page to virtual cemeteries with information regarding burial locations, often including pictures of their memorial stones, links to other family members, and more. Children's Sunday School will meet from 11:00 a.m. - 12:00 a.m. in the "Gathering Place" in the basement. We will continue our adventure and learn about Simon Peter just like the adults. Presbyterian Women's and Presbyterian Men’s Wednesday Evening Bible Study -- 7:00 p.m.
Beginning Wednesday, March 13th, and throughout Lent, we will be studying the book "Simon Peter,” by Adam Hamilton. We will meet in the sanctuary to watch the video and then dismiss and go to the Fellowship Hall to have our discussion. The Holly Presbyterian Church supports two missionary families as part of our ongoing outreach to the world: the Keefer family (serving Christ through their Athletes in Action ministry at U of M in Ann Arbor, Michigan) and the Iobst family (serving Christ through the Operation Transit ministry in Algeciras, Spain). We are called to act as the hands and feet of Christ in our world, and because we cannot all serve in full time ministry, we offer our support financially, and spiritually, to those who do. Please pray for these families and consider sending them a note or e-mail of encouragement. The "In The Beginning" Baby Pantry -- located on the lower level -- is a free resource for parents of infants, providing new and gently used clothing, linens, incidentals, diapers, formula, and emotional support for families experiencing tough times. Give & Take Library: We have added a "Give and Take Library" to our baby pantry and invite the entire Holly Presbyterian Church family to support this expanded ministry by donating children's books (used or new). The families love this new library and are being blessed by it! Thank you to all who have contributed. Friday, April 26 -- 10:00 a.m. - 12:00 p.m.
Friday, May 10 -- 10:00 a.m. - 12:00 p.m.
Saturday, May 18 -- 10:00 a.m. - 12:00 p.m.
Friday, May 24 -- 10:00 a.m. - 12:00 p.m.
On the First Sunday of each month, order your gift cards at face value to your favorite restaurant, retail store, gas station, movie theater, etc. You can click here for a list of participating retailers and their discount rates. On the Second Sunday of each month you will receive your order. The church will earn, on average, 4% - 5% of the face value of the cards ordered. Orders can be given to Vicki Lyles on the first Sunday of each month, or placed in the offering plate. If you have any questions please see Vicki. will be available for pick up Sunday, April 14. If so, please sign up on Amazon Smile. You can select Holly Presbyterian Church as your organization. We recycle batteries of all sizes as well as ink cartridges. On top of that we are able to turn them in for cash, which goes back to the church. Don't forget when you replace your next battery or cartridge to bring in your empty to the narthex. Thank you. Click the “Give Now” button below. This will take you directly to the Holly Presbyterian Church’s secure donation form on the Presbyterian Mission Exchange’s Website. Completely fill out the form using the easy-to-use instructions and then click-on the “Give Now” button at the bottom of that page. You will then see a “Thank You” screen. You will receive an e-mail from the Presbyterian Mission Exchange acknowledging your donation to the Holly Presbyterian Church, which can then be used as a receipt for your IRS tax form. The church treasurer will simultaneously receive an e-mail notification of your donation for the church’s records. to the secure donation form.